Scientists with the U.S. Department of Energy’s Lawrence Berkeley National Laboratory (Berkeley Lab) and the University of California (UC) Berkeley, using a unique optical trapping system that provides ensembles of ultracold atoms, have recorded the first direct observations of distinctly quantum optical effects – amplification and squeezing – in an optomechanical system. Their findings point the way toward low-power quantum optical devices and enhanced detection of gravitational waves among other possibilities. 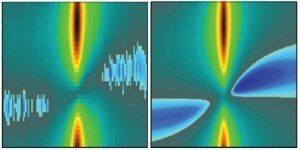 “We’ve shown for the first time that the quantum fluctuations in a light field are responsible for driving the motions of objects much larger than an electron and could in principle drive the motion of really large objects,” says Daniel Brooks, a scientist with Berkeley Lab’s Materials Sciences Division and UC Berkeley’s Physics Department. Brooks, a member of Dan Stamper-Kurn’s research group, is the corresponding author of a paper in the journal Nature describing this research. The paper is titled “Nonclassical light generated by quantum-noise-driven cavity optomechanics.” Co-authors were Thierry Botter, Sydney Schreppler, Thomas Purdy, Nathan Brahms and Stamper-Kurn. Light will build-up inside of an optical cavity at specific resonant frequencies, similar to how a held-down guitar string only vibrates to produce specific tones. Positioning a mechanical resonator inside the cavity changes the resonance frequency for light passing through, much as sliding one’s fingers up and down a guitar string changes its vibrational tones. Meanwhile, as light passes through the optical cavity, it acts like a tiny tractor beam, pushing and pulling on the mechanical resonator. If an optical cavity is of ultrahigh quality and the mechanical resonator element within is atomic-sized and chilled to nearly absolute zero, the resulting cavity optomechanical system can be used to detect even the slightest mechanical motion. Likewise, even the tiniest fluctuations in the light/vacuum can cause the atoms to wiggle. Changes to the light can provide control over that atomic motion. This not only opens the door to fundamental studies of quantum mechanics that could tell us more about the “classical” world we humans inhabit, but also to quantum information processing, ultrasensitive force sensors, and other technologies that might seem like science fiction today. Already cavity optomechanics has led to applications such as the cooling of objects to their motional ground state, and detections of force and motion on the attometer scale. However, in studying interactions between light and mechanical motion, it has been a major challenge to distinguish those effects that are distinctly quantum from those that are classical – a distinction critical to the future exploitation of optomechanics. Brooks, Stamper-Kurn and their colleagues were able to meet the challenge with their microfabricated atom-chip system which provides a magnetic trap for capturing a gas made up of thousands of ultracold atoms. This ensemble of ultracold atoms is then transferred into an optical cavity (Fabry-Pferot) where it is trapped in a one-dimensional optical lattice formed by near-infrared (850 nanometer wavelength) light that resonates with the cavity. A second beam of light is used for the pump/probe. The Berkeley research team first applied classical light modulation to a low-powered pump/probe beam (36 picoWatts) entering their optical cavity to demonstrate that their system behaves as a high-gain parametric optomechanical amplifier. They then extinguished the classical drive and mapped the response to the fluctuations of the vacuum. This enabled them to observe light being squeezed by its interaction with the vibrating ensemble and the atomic motion driven by the light’s quantum fluctuations. Amplification and this squeezing interaction, which is called “ponderomotive force,” have been long-sought goals of optomechanics research. Since squeezing light improves the sensitivity of gravitational wave detectors, the ponderomotive squeezing effects observed by Brooks, Stamper-Kern and their colleagues could play a role in future detectors. The idea behind gravitational wave detection is that a ripple in the local curvature of spacetime caused by a passing gravitational wave will modify the resonant frequency of an optical cavity which, in turn, will alter the cavity’s optical signal. The results of this study differ significantly from standard linear model predictions. This suggests that a nonlinear optomechanical theory is required to account for the Berkeley team’s observations that optomechanical interactions generate non-classical light. Stamper-Kern’s research group is now considering further experiments involving two ensembles of ultracold atoms inside the optical cavity. This research was funded by the Air Force Office of Scientific Research and the National Science Foundation.